Camellias, especially most varieties of C. japonica, can tolerate surprisingly low temperatures in winter, particularly if they are sheltered from cold winds during relatively short spells of 3 or 4 days of below freezing conditions and have had a chance to become dormant. With mature plants in a garden border roots are relatively safe, especially if covered by a good depth of fresh mulch. 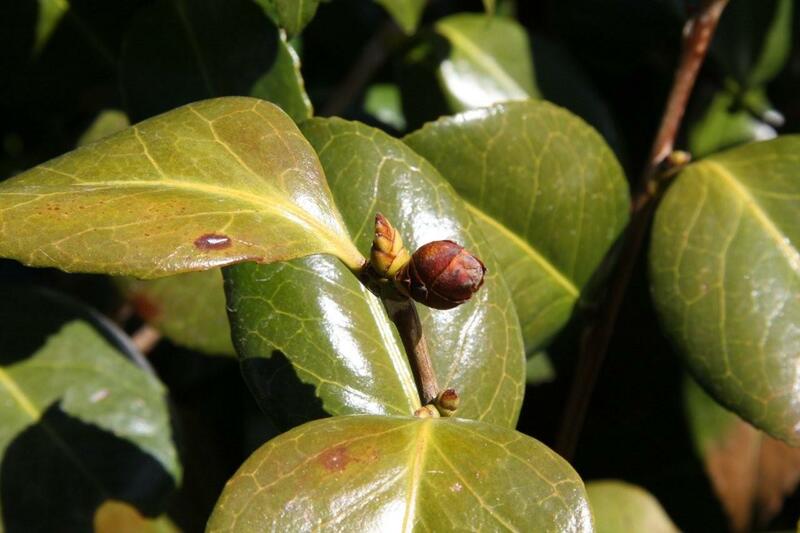 Leaves may however be discoloured, but will usually recover in spring, and flower buds may be frozen and fall off. The much smaller growth buds are more likely to survive, especially those in the middle of bushes where they are more protected. 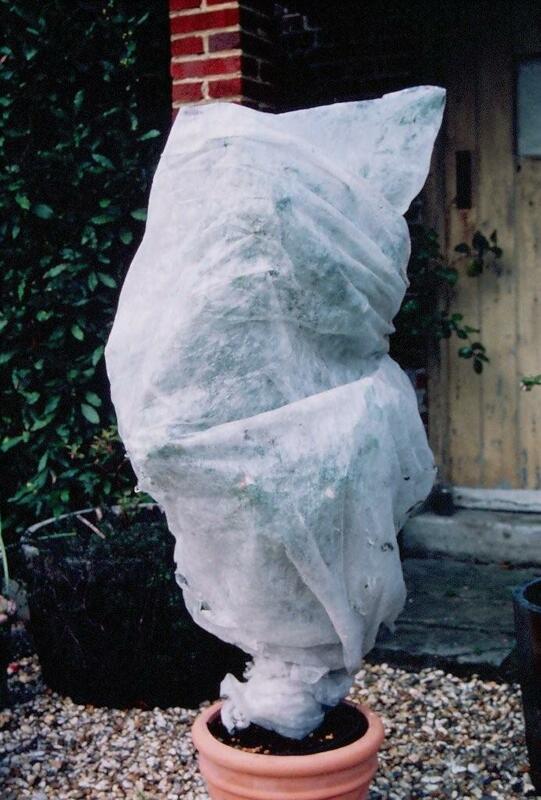 Several layers of horticultural fleece draped over bushes and secured to prevent being blown away is often successful in giving some protection. Especially useful for early blooming camellias. 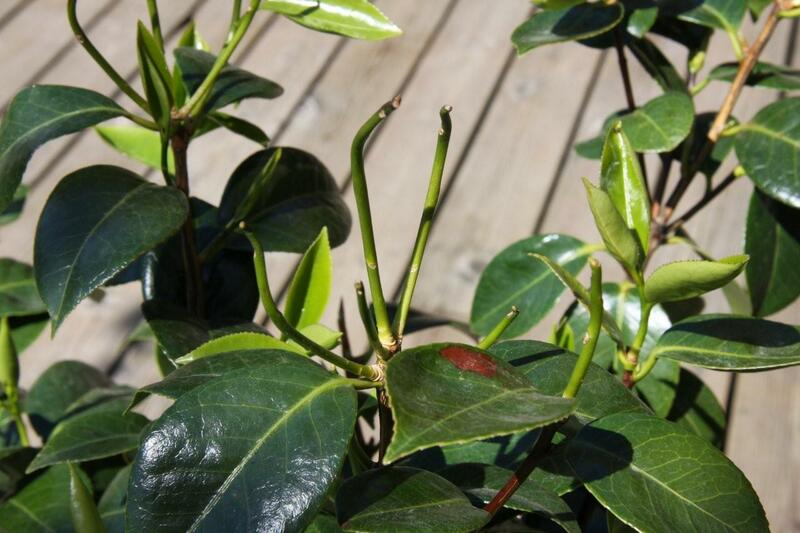 Camellias in containers are more vulnerable to winter damage as their roots lack the insulation of surrounding soil. They are especially vulnerable if compost becomes water-logged. If plants are small enough to do so its a good idea to carry them into an unheated greenhouse, shed or garage during periods when below-freezing conditions are expected. (The warm dry atmosphere of modern centrally heated homes is not suitable and usually causes leaves to fall and eventual plant death). Their compost can be kept fairly dry too, but may need watering in prolonged periods of sunny, dry conditions. The still air here will reduce the risk of root damage, even if the soil freezes for short periods of a few days, as there is no wind to draw water from the leaves which can cause dehydration. If kept outside, bring plants into sheltered positions near buildings if at all possible. 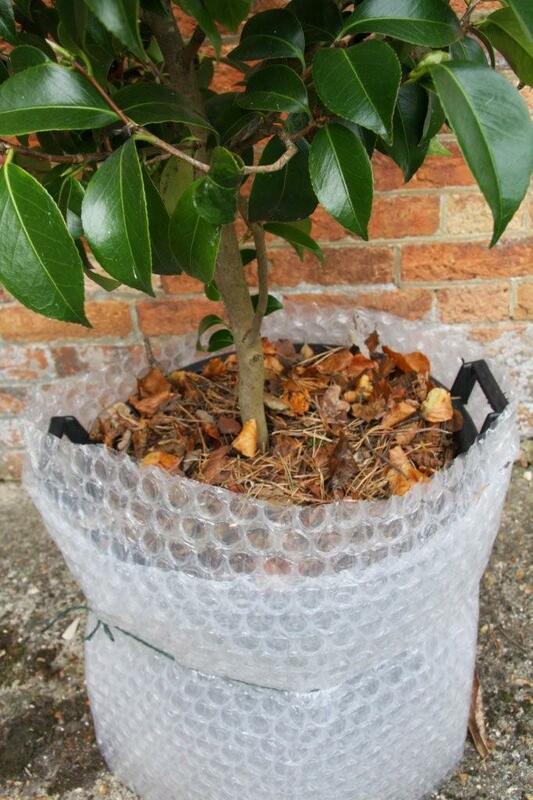 Wrap with several layers of plastic ‘bubble wrap’ to reach the ground and just above the rims of posts. Tie securely. Cover compost with fresh dry leaves or any other material which provides good air pockets and therefore good insulation. 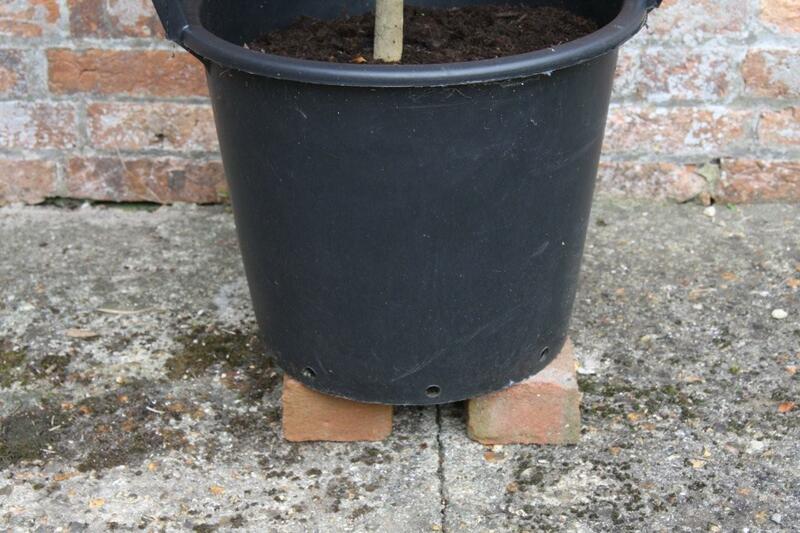 Keep an eye out for compost drying out and water if necessary, early in the day during a frost-free period.